Your floor tiles probably looked wonderful when they were all shiny and new. The grout was clean and fresh looking, too, and your floors were a thing of beauty. Over time, though, your tiles became dirty and the grout began to change colour. Normal wear and tear will do that, and because the grout is set into a shallow gutter between the tiles, it’s the perfect place for dirt to build up and become trapped. No amount of regular domestic cleaning can stop the grout from changing colour. Grout is porous so it absorbs grease and stains from colourful foods like Indian or even your favourite lasagne. Once the stains are in, they are almost impossible to shift. Cleaning grout is hard work. Let’s face it; cleaning grout isn’t easy, nor is it fun to do. We’ve heard stories of people spending days on their hands and knees, cleaning the grout on their floors with a toothbrush. We’ve also heard of people who have become so confused with the choice of commercial cleaners available that they ended up doing nothing. Acidic grout cleaners cause damage. Many commercial grout cleaners are acidic, which means you could be damaging your tiles or stone flooring while you’re scrubbing out your grout lines. The acid eats away at the grout and, over time, can wear it away completely. One of the best natural solutions to use is a combination of baking soda and a small amount of white vinegar. Mix this into a solution and then, using an old toothbrush, scrub your grout clean. Wipe over with clean water. An alternative method of cleaning your grout is to use a steam cleaner. When you hire a steam cleaner, always ask for the grout cleaning attachment to be included. Steam is an effective cleaner and the high temperature helps kill off germs and bacteria that may be hiding in your grout. Simply scrub your grout lines with the steam filled brush until it is clean, and wipe your tiles over afterwards to clear up any residue. Because you have better things to do than spend the day kneeling on your floor while you scrub, we recommend using the services of a professional grout cleaner. A professional clean each year will keep your tiles and grout looking fresh, clean and new. And, of course, a professional can spot any potential problems that your cleaning efforts might have created, and come up with the perfect solution. 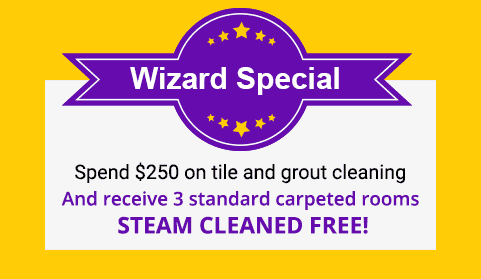 Wizard’s Tile & Grout Cleaning Services are affordable, professional and reliable, and happy to give you advice on how to maintain your freshly cleaned grout. Contact us for your floor grout cleaning needs and save your poor old knees. Steam Carpet Cleaning Melbourne – 3 Rooms for $60 – Call Now!